We searched Medline, Cochrane and international trial registries between 1955 and 2009 for randomised controlled trials investigating the effect of cocoa as food or drink compared with placebo on systolic and diastolic blood pressure (SBP/DBP) for a minimum duration of 2 weeks. We conducted random effects meta-analysis of all studies fitting the inclusion criteria, as well as subgroup analysis by baseline blood pressure (hypertensive/normotensive). Meta-regression analysis explored the association between type of treatment, dosage, duration or baseline blood pressure and blood pressure outcome. Statistical significance was set at P < 0.05. Fifteen trial arms of 13 assessed studies met the inclusion criteria. Pooled meta-analysis of all trials revealed a significant blood pressure-reducing effect of cocoa-chocolate compared with control (mean BP change ± SE: SBP: -3.2 ± 1.9 mmHg, P = 0.001; DBP: -2.0 ± 1.3 mmHg, P = 0.003). 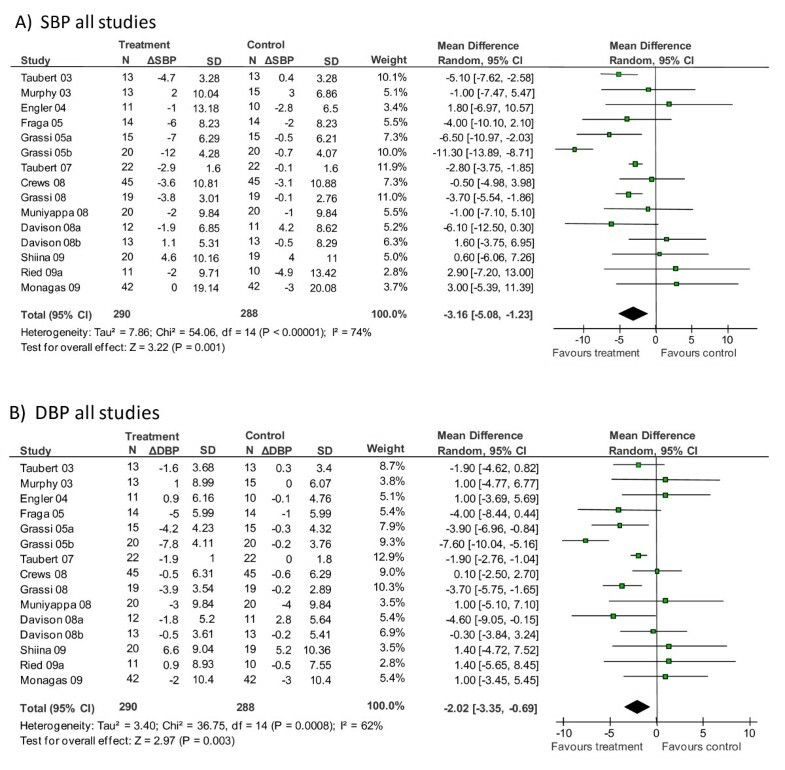 However, subgroup meta-analysis was significant only for the hypertensive or prehypertensive subgroups (SBP: -5.0 ± 3.0 mmHg; P = 0.0009; DBP: -2.7 ± 2.2 mm Hg, P = 0.01), while BP was not significantly reduced in the normotensive subgroups (SBP: -1.6 ± 2.3 mmHg, P = 0.17; DBP: -1.3 ± 1.6 mmHg, P = 0.12). Nine trials used chocolate containing 50% to 70% cocoa compared with white chocolate or other cocoa-free controls, while six trials compared high- with low-flavanol cocoa products. Daily flavanol dosages ranged from 30 mg to 1000 mg in the active treatment groups, and interventions ran for 2 to 18 weeks. Meta-regression analysis found study design and type of control to be borderline significant but possibly indirect predictors for blood pressure outcome. Our meta-analysis suggests that dark chocolate is superior to placebo in reducing systolic hypertension or diastolic prehypertension. Flavanol-rich chocolate did not significantly reduce mean blood pressure below 140 mmHg systolic or 80 mmHg diastolic. Flavanol-rich chocolate and cocoa products have attracted interest as nonpharmacological treatment options for high blood pressure, a known risk factor for cardiovascular disease [1, 2]. Even small reductions in blood pressure substantially reduce cardiovascular risk [3, 4]. Current guidelines strongly recommend integration of lifestyle modification and complementary treatment with the use of conventional blood pressure medications . Polyphenols, in particular flavanols in cocoa products, have been shown to increase the formation of endothelial nitric oxide, which promotes vasodilation and consequently may lower blood pressure [6–8]. Meta-analyses by Taubert et al. (2007) , including five small trials [10–13], and Desch et al. (2010) , including 10 trials [10–13, 15–20], concluded that cocoa-rich foods may reduce blood pressure. However, additional trials have been published since then, with conflicting results [21–24]. Our study updates current research on the effect of cocoa-rich products taken daily for two or more weeks compared with placebo on blood pressure in adults. In addition, we explored the influence of baseline blood pressure, dosage, duration, type of control, study design, age, body mass index and trial quality on blood pressure outcome. We searched the Medline and Cochrane databases for randomised controlled trials of chocolate or cocoa on blood pressure published between 1955 and 2009 using the following search terms: chocolate OR cocoa AND blood pressure. We also searched reference lists of published studies and checked international trial registries http://www.clinicaltrials.gov; http://www.trialregister.nl; http://www.anzctr.org.au; http://www.controlled-trials.com for unpublished but completed studies investigating chocolate/cocoa for blood pressure. Trials were included in the meta-analysis if the control group received a placebo or a low dose of flavanol-containing cocoa product (drink, bar or tablet), the trial duration was ≥ 14 days, and the clinical mean or median systolic or diastolic blood pressure (SBP/DBP) and standard deviation (SD) were available. We contacted authors of studies which did not report numerical mean SBP/DBP or SD and received datasets from two studies [18, 22], which we included in the meta-analysis. Three eligible completed but unpublished studies were excluded because data were not available at the time of this study [25–27]. Data were abstracted and quality was assessed independently by two investigators (KR, PF) using guidelines published by the Cochrane Collaboration  (Tables 1,2,3). Any disagreement was resolved by discussion between the authors (KR, PF) in consultation with the statistician (TS). Characteristics of trials included in the meta-regression analysis are shown in Table 1. We assessed quality on the basis of randomisation, blinding, whether blood pressure was a primary outcome measure, loss to follow-up, funding source and whether compliance and dietary chocolate intake had been assessed, as these could have influenced findings (Table 3). No trial was excluded in the meta-analysis on grounds of quality; however, higher-quality trials (score ≥ 3.5 of 5 points) were compared with lower-quality trials by meta-regression analysis. b7-day washout period before crossover. c7-day washout period before crossover. For abbreviations, see Table 1 footnote. All 15 trial arms were adequately randomised. Meta-analysis was conducted using the Cochrane Program Review Manager version 5 . Owing to high heterogeneity between trials, we used a random effects model and considered subgroup meta-analysis by baseline mean blood pressure, similar to our recent meta-analysis of the effect of garlic on blood pressure . For systolic blood pressure, trials were divided into a hypertensive subgroup (SBP ≥ 140 mmHg) and a normotensive subgroup (SBP < 140 mmHg) at the start of treatment. For diastolic blood pressure, a division into a higher BP subgroup (DBP ≥ 80 mmHg) and lower BP subgroup (DBP < 80 mmHg) at the start of treatment allowed an even distribution of trials between subgroups and reduction in heterogeneity. Meta-regression analyses were conducted using Stata version 10  to explore reasons for high heterogeneity in the pooled meta-analysis of all studies. The following variables were tested, as their associations with blood pressure outcomes are physiologically plausible: Dosage of polyphenols in the active treatment group (continuous variable), type of control (categorical variable: low-flavanol control as drink, tablet or bar/flavanol-free control as white chocolate, milk, or placebo capsules), duration (continuous and categorical > 2 weeks yes/no), study design (parallel versus crossover), starting SBP (continuous and categorical > 140 mmHg yes/no), starting DBP (continuous and categorical >80 mmHg yes/no), quality score (≥ 3.5 yes/no), average body mass index (BMI) (continuous and categorical > 25 or > 30 yes/no) and average age (continuous). If meta-regression results indicated a variable to contribute significantly to heterogeneity between studies, subgroup analysis by this variable was conducted, testing whether there was an effect of treatment on blood pressure outcomes within each subgroup. If heterogeneity was reduced, the subgroup analysis provided a more reliable estimate of pooled effect size between the treatment groups. Additionally, sensitivity analysis excluding selected trials explored the robustness of results. Publication bias or small study effect was assessed by Begg's funnel plots and Egger's regression tests [32, 33]. A total of 18 publications including 21 trial arms were assessed in detail for inclusion [10–13, 15–24, 34–38] (Figure 1). Fifteen trial arms reported in 13 publications met the inclusion criteria [10–13, 15–18, 20–24] (Figure 1, Table 1). Six trial arms were excluded because 1) the same population and protocol were used in  compared with ; 2) the comparison group received other vasoactive substances rather than placebos as a) chocolate ± plant sterols [34, 35], b) tomato extract in phase 2 of trial , or c) half dose of chocolate ; 3) mean SBP/DBP and SD were not reported and could not be obtained from the authors ; and 4) the trial was of 1-day duration  (Table 2). Flow diagram of trial selection. The 15 trial arms included in our meta-analysis were adequately randomised; double-blinding was achieved in five trial arms using low-flavanol-containing products as control [11, 15, 20, 21]. All but three trial arms [15, 22, 24] assessed blood pressure as the primary outcome measure, and 12 of the 15 trial arms had a participant attrition of less than 20% [10, 11, 13, 15–18, 22–24] (Table 3). Eight trial arms used a parallel study design [11, 15–17, 21–23], and seven study arms used a crossover design [10, 12, 13, 18, 20, 24]. All but two [12, 24] of the seven crossover trials incorporated a washout period of 7 days between the alternate treatment period. In eight trials the intervention period was 2 weeks (14 or 15 days) [10–13, 18, 20, 22], while longer intervention periods were trialled in seven studies (range 4-18 weeks) [15–17, 21, 23, 24]. Eight trials employed a 7-day run-in period before commencing with the treatments [10, 13, 16–18, 20, 22] (Table 1). Polyphenol content varied widely between the trials (range 30-1008 mg/day, Table 1). Although authors labelled the active ingredient in chocolate with a variety of terms (polyphenol, flavanol, proanthocyanidin, epicatechin and catechin), we are reasonably confident that the reported dosages of total polyphenol or measured derivates are comparable. There is some confusion in the literature about the correct labelling of the vasoactive chemical components in cocoa, and terms are often used interchangeably and sometimes incorrectly. Furthermore, the most commonly used methods for polyphenol content analysis (high performance liquid chromatography  and Folin-Ciocalteu method ) each measure both monomer (epicatechin and catechin) and oligomer (proanthocyanidin) polyphenol components. These polyphenol components belong to the flavanols or flavanoids, which make up 99% of all polyphenols in cocoa [41, 42]. However, we were not able to compare findings by method of polyphenol content analysis, as details were not available for all trials. We collated information on age and weight/BMI because age and BMI may influence responsiveness to blood pressure treatment [43, 44]. Mean age and BMI varied substantially between trials: mean age ranged between 18 and 70 years, and mean BMI was in the overweight/obese category for 9 of the 15 trials (mean BMI: < 25, n = 6; 25-30, n = 6; > 30, n = 3). 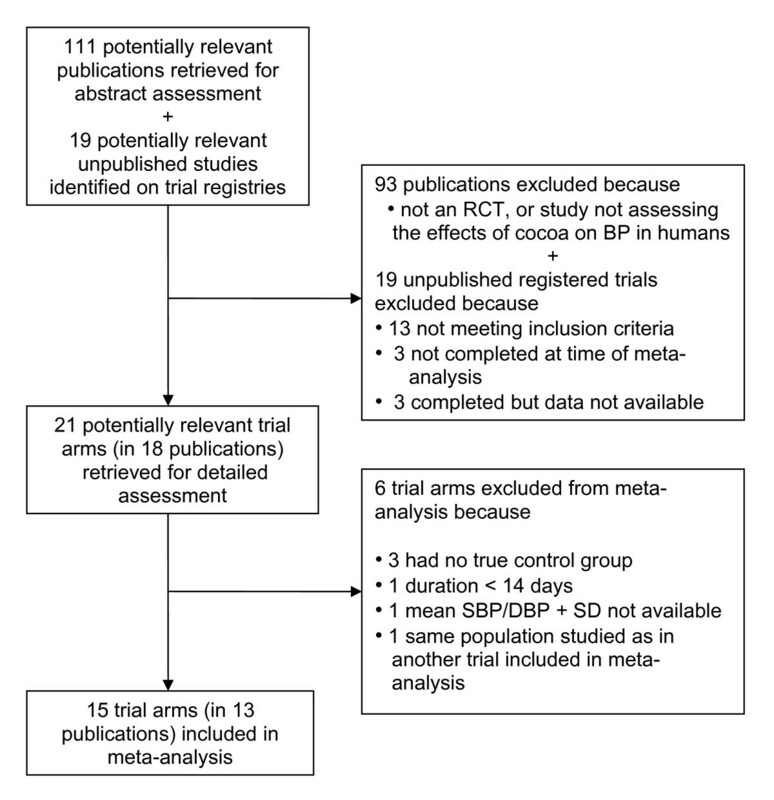 Meta-analysis of all 15 trial arms revealed a significant blood pressure-reducing effect of cocoa/chocolate compared with control (pooled mean SBP: -3.16 [95% CI, -5.08, -1.23] mmHg, P = 0.001; pooled mean DBP: -2.02 [95% CI, -3.35, -0.69] mmHg, P = 0.003) (Figure 2). Heterogeneity between trials was high (SBP: I 2 = 74%; DBP: I 2 = 62%), prompting subgroup meta-analysis by baseline blood pressure as well as meta-regression and sensitivity analyses. We pooled trial arms with mean baseline SBP in the hypertensive range (SBP ≥ 140 mmHg) and trial arms with mean baseline SBP of < 140 mm Hg. While meta-analysis of the SBP hypertensive subgroup remained significant (SBPhyper: -5.02 [95% CI, -7.99, -2.05] mmHg; P = 0.0009; Figure 3A), meta-analysis of the SBP normotensive subgroup demonstrated no significant difference in blood pressure reduction between the chocolate/cocoa group and the control group (SBPnormo: -1.56 [95% CI, -3.81, 0.68] mmHg, P = 0.17; Figure 3B). Heterogeneity remained high in the hypertensive subgroup, but was reduced in the SBP normotensive subgroup (SBPhyper: I 2 = 90%; SBPnormo: I 2 = 23%). Subgroup meta-analysis of the effect of chocolate/cocoa on (A) systolic blood pressure of hypertensive subjects (≥ 140 mmHg at baseline) or (B) 'normotensive' subjects (< 140 mmHg at baseline) and on (C) diastolic blood pressure of (pre-)hypertensive subjects (≥ 80 mmHg) or (D) 'normotensive' subjects (< 80 mmHg). See Figure 2 legend for abbreviation definitions. For subgroup analysis of diastolic blood pressure, we pooled trial arms with mean baseline DBP in the hypertensive and prehypertensive range (DBP ≥ 80 mmHg) and trials with mean baseline DBP < 80 mm Hg. Three of the six trial arms in the subgroup with DBP ≥ 80 mmHg reported mean DBP values at baseline in the hypertensive range (≥ 90 mmHg) [13, 18, 20], while three trials reported mean DBP at baseline in the prehypertensive range (84-86 mmHg) [10, 16, 24]. Results of DBP subgroup analyses were similar to the results of SBP subgroup analyses. While the DBP pre-/hypertensive subgroup analysis remained significant (DBPhyper: -2.73 [95% CI, -4.89, -0.58] mmHg, P = 0.01; I 2 = 79%; Figure 3C), DBP normotensive subgroup analysis demonstrated no significant difference between chocolate and control groups (DBPnormo: -1.28 [95% CI, -2.88, 0.33] mmHg, P = 0.12; I 2 = 24%; Figure 3D). Funnel plots and Egger's test indicated no publication bias (Figure 4). Funnel plots of trials included in the meta-analysis for (A) systolic blood pressure and (B) diastolic blood pressure. The vertical line of Begg's funnel plot represents the pooled mean effect size, and the dotted lines represent the 95% confidence interval. P values are derived from Egger's test. 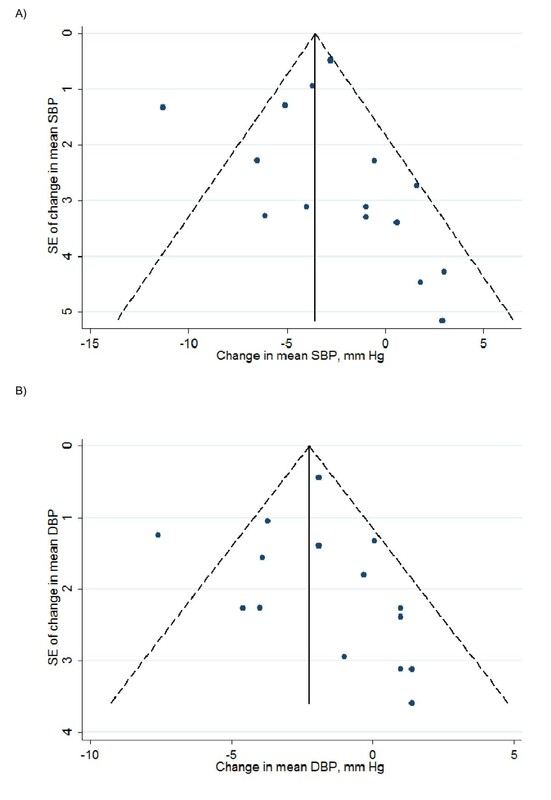 Five variables tested (dosage, duration, quality score, age and BMI) did not show any significant association with blood pressure outcomes in the meta-regression analysis, while study design (parallel versus crossover) was borderline significantly associated with BP outcome (SBP: P = 0.053; DBP: P = 0.060); and type of control (flavanol-free control versus low-flavanol product as control) was borderline significant for DBP (P = 0.052). Subgroup analyses revealed reduced heterogeneity in the subgroup including parallel trials, but high heterogeneity remained in the subgroup with crossover trials (Table 4). Similarly, the subgroup including low-flavanol products as control demonstrated lower heterogeneity and no significant difference between treatment groups, in contrast to the subgroup with flavanol-free unblinded controls (Table 4). SBP, systolic blood pressure; DBP, diastolic blood pressure; mmHg, millimetre mercury; CI, confidence interval; P, probability value (P < 0.05 statistically significant); I 2, heterogeneity test. aSensitivity analysis excluding trial , as this trial used a notably lower dose and longer duration than the other trials included in the meta-analysis. However, the results of these subgroup analyses need to be interpreted cautiously, as three of seven trial arms with a crossover study design were conducted by the same study team [13, 18], and five of nine study arms using a flavanol-free control were conducted by two teams within similar population groups [10, 13, 16, 18]. Therefore, study design or type of control might in fact be indirect predictors of BP outcome through other factors such as dietary habits of the study population. Sensitivity analyses excluding trial , as this trial used a notably lower dose and longer duration than the other trials, did not change the results appreciably, with one exception: A small but statistically significant difference between treatment groups in subgroup analyses of trials with a parallel design shifted to a nonsignificant effect when trial  was excluded (Table 4). Our meta-analysis including 15 trial arms demonstrated a small but significant blood pressure-reducing effect of flavanol-rich cocoa products compared with control (mean BP change ± SE: SBP: -3.2 ± 1.9 mmHg, P = 0.001; DBP: -2.0 ± 1.3 mmHg, P = 0.003). These effect sizes were smaller than in previous meta-analyses including fewer trials (Taubert et al. (2007), 5 trials, SBP: -4.7 ± 2.9 mmHg, P = 0.002; DBP: -2.8 ± 2.0 mmHg, P = 0.006, ; and Desch et al. (2010), 10 trials, SBP: -4.5 ± 1.4 mmHg, P = 0.001, DBP: -2.5 ± 1.4 mmHg, P = 0.001, ). In contrast to previous meta-analyses [9, 14], subgroup analyses in our larger meta-analysis suggested that there is a difference in outcome dependent on baseline blood pressure (hypertensive versus normotensive). 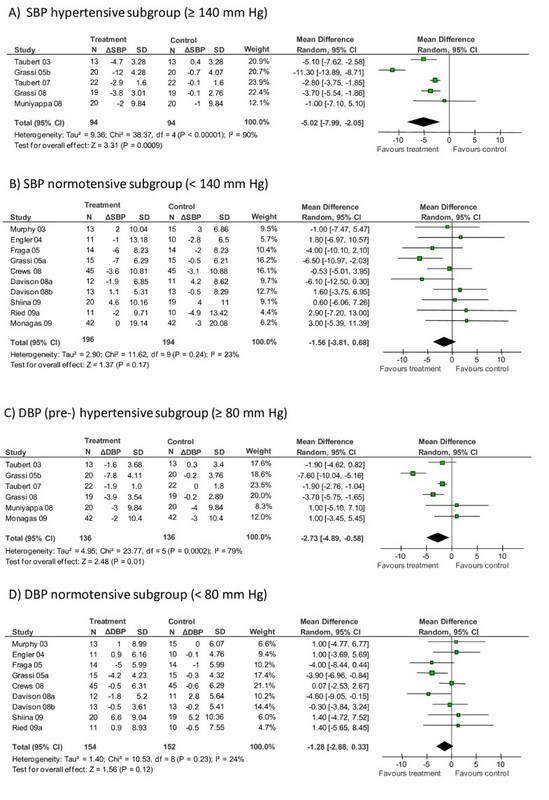 While meta-analyses of the hypertensive subgroups found significant reductions (SBP: -5.0 ± 3.0 mmHg, P = 0.0009; DBP: -2.7 ± 2.2 mmHg, P = 0.01), analyses of normotensive subgroups did not demonstrate a significant reduction in blood pressure of flavanol-rich cocoa products (SBP: -1.6 ± 2.3 mmHg, P = 0.17; DBP: -1.3 ± 1.6 mmHg, P = 0.12). These findings are in line with meta-analyses of other nutritional supplements on blood pressure, which similarly found that blood pressure was significantly reduced in hypertensive subgroups but not in the normotensive subgroups [30, 45]. Heterogeneity was reduced satisfactorily in the normotensive subgroups, indicating that trials in these subgroup analyses are highly comparable and the meta-analyses results can be interpreted with confidence. In contrast, heterogeneity remained high in the hypertensive subgroups, influenced greatly by one relatively small study arm , which demonstrated a large blood pressure reduction not matched by the other trials. Therefore, effect sizes and levels of significance of the subgroup meta-analyses of trials with (pre-)hypertensive subjects at baseline should be interpreted more cautiously. The relatively modest but significant blood pressure-lowering effect of cocoa in the hypertensive subgroup is clinically relevant: a decline of 5 mmHg in systolic blood pressure may reduce the risk of a cardiovascular event by about 20% over 5 years . Furthermore, the effect of cocoa in a hypertensive population is comparable to other lifestyle modifications, such as moderate physical activity (30 min/d) may reduce SBP by 4-9 mmHg . Meta-regression analyses suggested study design (parallel versus crossover) and type of control (flavanol-free versus low-flavanol) to be significant predictors of blood pressure outcome but failed to show any statistically significant associations in the other variables tested. However, study design as well as type of control might be indirect predictors, as about half the trials using a crossover design and white chocolate as flavanol-free control were conducted by the same two teams and within similar study populations [10, 13, 16, 18]. It is possible that participants shared characteristics that contributed to their responsiveness to cocoa products, such as local dietary habits or genetic/ethnic disparity [47, 48]. Inclusion of trial location as a variable was impractical in our meta-regression analysis; however, future research may explore this further. Furthermore, results of trials using flavanol-free controls, including white chocolate or milk, might overestimate the effect of the active treatment, owing to potential bias of unblinded participants. Therefore, related subgroup analyses need to be interpreted cautiously. Meta-regression analysis did not suggest an association between dosage, duration, quality of trials, age, BMI and blood pressure outcome. However, inclusion of future trials in meta-regression analysis might provide further insight into predicting factors. While regular consumption of flavanol-rich cocoa products may have a beneficial short-term effect in reducing blood pressure in hypertensive individuals, the practicability of chocolate or cocoa drinks as long-term treatment is questionable. A recent small study by our team investigating the acceptability of commercially available chocolate bars as an alternative treatment to capsules concluded that daily chocolate consumption for blood pressure may not be an acceptable and practical treatment option . Our meta-analysis of 15 trial arms suggests that dark chocolate and flavanol-rich cocoa products are superior to placebo in reducing systolic hypertension and diastolic prehypertension. However, flavanol-rich cocoa products did not significantly reduce mean blood pressure below 140 mmHg systolic or 80 mmHg diastolic. Additional trials of hypertensive populations are needed to elucidate whether local dietary habits or genetic factors influence the blood pressure-lowering effect of cocoa. We gratefully acknowledge the assistance by N Funabashi  and D Grassi  who provided unpublished data for inclusion in our meta-analysis. This study was supported by the Royal Australian College of General Practitioners (RACGP) 2006 Cardiovascular Health Research Grant, and the Australian Government Primary Health Care Research Evaluation Development (PHCRED) Program. KR, ORF and NPS conceptualised the study and obtained funding. Data was acquired independently by KR and PF. KR and TS undertook data analysis and interpretation. KR prepared the manuscript with contributions from all co-authors. All authors approved the final version.